Users can choose between two different key formats depending on their personal preference. Lucid Phoenix keys are interactive keys that are still dichotomous and a choice needs to be made at each key couplet to continue. For more information concerning Lucid keys visit www.lucidcentral.org. The standard dichotomus key is a web based version of the traditional printed couplet key. Krombein, K.V. 1983. Three New Egg Parasites of South African Walking Sticks (Hymenoptera: Chrysididae, Amiseginae). Journal of the Entomological Society of South Africa 46: 139-146. Krombein, K.V. 1984. Two New Egg Parasites of South African walking sticks and notes on two previously described species (Hymenoptera: Chrysididae, Amiseginae). Journal of the Entomological Society of South Africa 47: 211-215. Krombein, K.V. 1986. 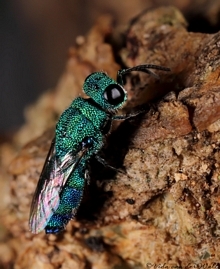 A remarkable new African amisegine wasp (Hymenoptera: Chrysididae: Amiseginae). Proceedings of the Entomological Society of Washington 88: 509-514. Krombein, K.V. 1994. A new Anachrysis from South Africa (Hymenoptera: Chrysididae: Amiseginae). Proceedings of the Entomological Society of Washington 96: 339-341. Photographs © Simon van Noort (Iziko Museums of South Africa) or Vida van der Walt (Pretoria).